Being a good father is an art as well as a science. New dads need some handy tools to connect with their kids at the deepest level and inspire them to develop great habits, mindset and beliefs. But raising children in today's fast-paced world is more challenging than ever. One-Minute Super Dad gives you - the new dad - simple techniques that can be put into action in just a minute a day. Repeated consistently, they will help you forge a strong bond with your kids that will hold them in good stead for a lifetime. Featuring a Foreword by Raymond Aaron, author of Chicken Soup for the Parent's Soul, this book is an outcome of five years of passionate work, research, interviews and real-life experiences. Inspire your kids to a whole new level - lack of time no longer being a factor - and raise amazing children! 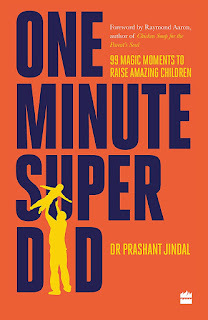 This book is so good, even non parents will enjoy it and better themselves from it. It helps you understand what is going on and gives you real life examples. It teaches you to fish instead of giving you a fish. You can then apply what you understand to all situations. It is written in a way that you can easily understand how to implement in real life. I would recommend every parent read this book, no matter the age of your children. I really enjoyed this book. It is clear and to the point. Ideal for anyone looking to develop their children with reinforcement. You will find teachings about guiding your children onto the right path and how to truly celebrate success and welcome failure as an opportunity.